My daughters loooooooove pretzels (frankly, I think they taste like cardboard), but when you dip pretzel rods into white chocolate, now you’re speaking a language I understand. Translation!!!! Sugar!!!! This recipe is super easy, and it’s one of those good family-bonding moments that you perform every so often to remind yourself that you love one another. The best part is that not only are they a delicious treat, but you get to flex your creativity and have lots of fun making them! In a large microwave safe mug, melt the white chocolate morsels in microwave until melted, approx 2-3 minutes. You may need to remove the chocolate after the first minute to stir. While chocolate is melting, pour the sprinkles on to plate. When the chocolate is gooey and melted, dip the end of the pretzels into the melted chocolate, about 3/4 of the pretzel should be covered. Lift the pretzel from the chocolate and rotate until evenly coated. Lay the chocolate-coated pretzel in the bed of sprinkles and rotate to coat. Let the pretzels dry and allow chocolate to harden. Enjoy!!!! DARCYVILLE … where stupidity is celebrated … with a deadly dose of sin. Two weeks before junior year, Darcy hops a plane to Orlando for a little R&R with her best friend Dylan and his family. Fresh off the heels of solving three murders in Valley, you’d think she’d sit back and enjoy the vacation capital of the world … maybe if you’re a noun. Darcy Walker, however, is nothing but verb. Before her feet hit the Orlando soil, she’s meddling in the disappearance of a five-year-old boy who vanished six months earlier. With authorities still no closer to solving the case, Darcy is shanghaied by her impulsivity and runs headlong into that proverbial burning building, convinced she can bring him home. She travels down a road that not only follows this missing child but branches off into the corrupt and sinister world of mob activity when she tampers in a case on which Dylan’s detective grandfather is working. 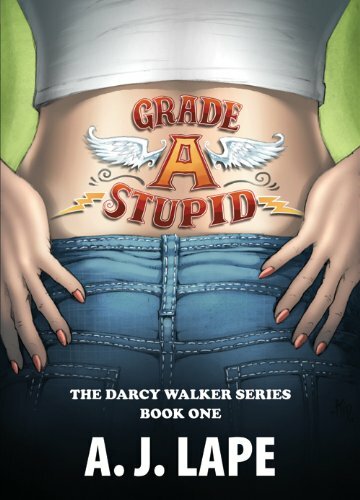 After a near disastrous midnight meeting in a warehouse and a date with a mechanical bull, Darcy realizes she might’ve bitten off more than she can chew. Add the boiling flirtationship with her best friend and the appearance of his romantic rival, and she is in over her head. Will she survive a life of flirting with death too easily? Or will her flirtationship with Dylan become the actual death of her instead? For a girl with a habit of finding dead bodies, No Brainer gives Darcy Walker more of the same … surprising twists and turns … and running for her life.